Simple cabling: The integrated spring clamps to connect control and power lines quickly ensure reliable and simple cabling. Easy parameterization: With the help of the parameterization software FR-Configurator a series of easy functions such as graphical machine analysis to optimize the drive system are available. Integrated control unit: The integrated Digital Dial gives the user direct access to all important parameters much more quickly than would be possible with normal keys. In addition to entering and displaying various parameters, the integrated four-digit LED display also monitors and displays current operating values and alarm messages. Compact installation: Due to the ultra-compact dimensions the FR-D700 SC can be mounted directly side by side. A line within the FR-D700 SC series allows effective space-saving heat dissipation through an approx. 1 cm thick cooling plate. Freely programmable digital outputs:Using the freely programmable transistor outputs, two of a total of 27 digital output signals, such as “Safety output monitor” or “Inverter operation ready” can be output. Simple network connection: The standard configuration of the FR-D700 SC has a serial interface (RS485) which allows communication with a PC and a PLC. Modbus RTU also a supported. Short service times: The fans are designed as compact units that can be replaced in less than 10 seconds for cleaning or in the event of failure. 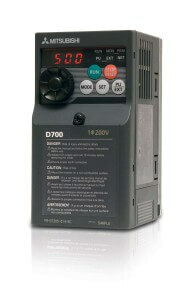 The FR-D700 SC’s OEC function helps to further optimize current and hence power consumption of the motor. The result is an additional decrease in energy requirement compared to a conventional inverter. The FR-D700 SC is designed for a service life of over 10 years. This is made possible, among other things, by high-performance heat resistant capacitors, cooling fans with sealed bearings and special lubricating grease. The flow of cooling air comes into contact only with the heat sinks and not electronic components. This ensures that no dust or dirt can collect on the components. The circuit boards are protected against aggressive environments with single or double layer conformal coating – another feature that ensures longer service life.